Can be ordered directly from Global Research (scroll down). Also available from Amazon and shortly in bookstores in the US. Montreal, Global Research Publishers. Centre for Research on Globalization (CRG), 2010. The complex causes as well as the devastating consequences of the economic crisis are carefully scrutinized with contributions from Ellen Brown, Tom Burghardt, Michel Chossudovsky, Richard C. Cook, Shamus Cooke, John Bellamy Foster, Michael Hudson, Tanya Cariina Hsu, Fred Magdoff, Andrew Gavin Marshall, James Petras, Peter Phillips, Peter Dale Scott, Bill Van Auken, Claudia von Werlhof and Mike Whitney. This book takes the reader through the corridors of the Federal Reserve, into the plush corporate boardrooms on Wall Street where far-reaching financial transactions are routinely undertaken. We bring to the attention of our readers some of the highlights of this important collection with selected excerpts from the various chapters. In all major regions of the world, the economic recession is deep-seated, resulting in mass unemployment, the collapse of state social programs and the impoverishment of millions of people. The economic crisis is accompanied by a worldwide process of militarization, a “war without borders” led by the United States of America and its NATO allies. The conduct of the Pentagon’s “long war” is intimately related to the restructuring of the global economy. The meltdown of financial markets in 2008-2009 was the result of institutionalized fraud and financial manipulation. The “bank bailouts” were implemented on the instructions of Wall Street, leading to the largest transfer of money wealth in recorded history, while simultaneously creating an insurmountable public debt. With the worldwide deterioration of living standards and plummeting consumer spending, the entire structure of international commodity trade is potentially in jeopardy. The payments system of money transactions is in disarray. Following the collapse of employment, the payment of wages is disrupted, which in turn triggers a downfall in expenditures on necessary consumer goods and services. This dramatic plunge in purchasing power backfires on the productive system, resulting in a string of layoffs, plant closures and bankruptcies. Exacerbated by the freeze on credit, the decline in consumer demand contributes to the demobilization of human and material resources. 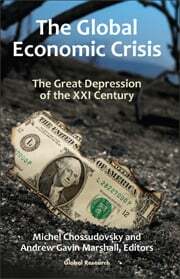 We are at the crossroads of the most serious economic crisis in world history. The economic crisis has by no means reached its climax, as some economists have predicted. The crisis is deepening, with the risk of seriously disrupting the structures of international trade and investment. What is distinct in this particular phase of the crisis is the ability of the financial giants –through stock market manipulation as well as through their overriding control over credit – not only to create havoc in the production of goods and services, but also to undermine and destroy large and well established business corporations. This crisis is far more serious than the Great Depression. All major sectors of the global economy are affected. Factories are closed down. Assembly lines are at a standstill. Unemployment is rampant. Wages have collapsed. Entire populations are precipitated into abysmal poverty. Livelihoods are destroyed. Public services are disrupted or privatized. The repercussions on people’s lives in North America and around the world are dramatic. America is dying. It is self-destructing and bringing the rest of the world down with it. It all began in the early part of the 20th century. In 1907, J.P. Morgan, a private New York banker, published a rumor that a competing unnamed large bank was about to fail. It was a false charge but customers nonetheless raced to their banks to withdraw their money, in case it was their bank. As they pulled out their funds, the banks lost their cash deposits and were forced to call in their loans. People therefore had to pay back their mortgages to fill the banks with income, going bankrupt in the process. The 1907 panic resulted in a crash that prompted the creation of the Federal Reserve, a private banking cartel with the veneer of an independent government organization. Effectively, it was a coup by elite bankers in order to control the industry. Much attention has rightly been paid to the techniques whereby mortgages were packaged together and then sliced and diced and sold to institutional investors around the world. Outright fraud may also have been involved in some of the financial shenanigans. The falling home values following the bursting of the housing bubble and the inability of many sub-prime mortgage holders to continue to make their monthly payments, together with the resulting foreclosures, was certainly the straw that broke the camel’s back, leading to this catastrophic system failure. A world depression, in which upward of a quarter of the world’s labor force will be unemployed, is looming. The biggest decline in trade in recent world history defines the future. The immanent bankruptcies of the biggest manufacturing companies in the capitalist world haunt Western political leaders. The “market” as a mechanism for allocating resources and the government of the U.S. as the “leader” of the global economy have been discredited. All the assumptions about “self-stabilizing markets” are demonstrably false and outmoded. The rejection of public intervention in the market and the advocacy of supply-side economics have been discredited even in the eyes of their practitioners. Among almost all conventional economists, pundits, investment advisors and various and sundry experts and economic historians, there is a common faith that in the long-run, the stock market will recover, the recession will end and the government will withdraw from the economy. Fixed on notions of past cyclical patterns and historical trends, these analysts lose sight of the present realities which have no precedent: the world nature of the economic depression, the unprecedented speed of the fall, and the levels of debt incurred by governments to sustain insolvent banks and industries and the unprecedented public deficits, which will drain resources for many generations to come. Is there an alternative to plundering the earth? Is there an alternative to making war? Is there an alternative to destroying the planet? No one asks these questions because they seem absurd. Yet, no one can escape them either. Until the onslaught of the global economic crisis, the motto of so-called “neoliberalism” was TINA: “There Is No Alternative!”No alternative to “neoliberal globalization”? No alternative to the unfettered “free market” economy? The notion that capitalism and democracy are one is proven a myth by neoliberalism and its “monetary totalitarianism”. The primacy of politics over economy has been lost. Politicians of all parties have abandoned it. It is the corporations that dictate politics. Where corporate interests are concerned, there is no place for democratic convention or community control. Public space disappears. The res publica turns into a res privata, or – as we could say today – a res privata transnationale (in its original Latin meaning, privare means “to deprive”). Only those in power still have rights. They give themselves the licenses they need, from the “license to plunder” to the “license to kill”. –Claudia Von Werlhof, Chapter 5. The mainstream media is now – for political reasons – in a constant clamor for the economy’s elusive “rock bottom”. This is so people will be more hopeful, less agitated, and more willing to let those who destroyed the economy continue running the country un-challenged. Every time a new economic indicator comes out that wasn’t “as bad as expected”, Wall Street cheers and politicians give their “we’ve turned the corner” speeches. Reality is thus turned on its head. The recession is creating a “fight or die” environment for corporations and governments around the world. The super rich that currently control both entities are using their influence to ensure that workers carry the brunt of this burden. It doesn’t have to be so. The fight for jobs, a living wage, progressive taxation, social security and single payer healthcare are all issues capable of uniting the vast majority of U.S. citizens. The sugar-coated bullets of the “free market” are killing our children. The act to kill is instrumented in a detached fashion through computer program trading on the New York and Chicago mercantile exchanges, where the global prices of rice, wheat and corn are decided upon. People in different countries are being impoverished simultaneously as a result of a global market mechanism. A small number of financial institutions and global corporations have the ability to determine the prices of basic food staples quoted on the commodity exchanges, thereby directly affecting the standard of living of millions of people around the world. The provision of food, fuel and water is a precondition for the survival of the human species. They constitute the economic and environmental foundations for development of civilized society. In recent years, both prior and leading up to the 2008-2009 financial meltdown, the prices of grain staples, including rice, corn and wheat, gasoline and water, has increased dramatically at the global level with devastating economic and social consequences. Globalization is accompanied by the increasing impacts of world hunger and starvation. Over 30 000 people a day (85 percent are children under the age of five) die of malnutrition, curable diseases and starvation. The numbers of unnecessary deaths has exceeded 300 million people over the past forty years. American people cringe at the thought of starving children, often thinking that there is little they can do about it, proclaiming, I am glad I live in America. However, in a globalized economy there are no safe enclaves, poverty and starvation elsewhere can become poverty and wretchedness here as well. Economic conquest is an integral part of America’s military adventure. The U.S. military and intelligence apparatus consults with Wall Street and the Texas oil giants. Conversely, the IMF and the World Bank, which have a mandate to supervise macroeconomic reform in developing countries, are in liaison with the U.S. State Department and the Pentagon. Economic warfare supports Washington’s military roadmap. The manipulation of market forces through the imposition of strong “economic medicine” under the helm of the IMF supports U.S.-NATO strategic and geopolitical objectives. Similarly, the speculative attacks waged by powerful banking conglomerates in the currency, commodity and stock markets are acts of financial warfare. They seek to destabilize the monetary systems of nation states. Historically, warfare has been an instrument of economic conquest. U.S. foreign policy and the Pentagon’s war plans are intimately related to the process of economic globalization. Strange as it may seem and irrational as it would be in a more logical system of world diplomacy, the “dollar glut” is what finances America’s global military build-up. It forces foreign central banks to bear the costs of America’s expanding military empire: effective “taxation without representation”. The military overhead is much like a debt overhead, extracting revenue from the economy. In this case it is to pay the military-industrial complex, not merely Wall Street banks and other financial institutions. The domestic federal budget deficit does not stem only from “priming the pump” to give away enormous sums to create a new financial oligarchy; it contains an enormous and rapidly growing military component. The domestic federal budget deficit does not stem only from “priming the pump” to give away enormous sums to create a new financial oligarchy; it contains an enormous and rapidly growing military component. The bailout measures of late 2008 may have consequences at least as grave for an open society as the response to 9/11 in 2001. Many members of Congress felt coerced at the time into voting against their inclinations, and the normal procedures for orderly consideration of a bill were dispensed with. America escaped from the depression of the 1890s with the Spanish-American War. It only escaped the Great Depression of the 1930s with the Second World War. There was even a recession in the late 1940s from which America only escaped with the Korean War. As we face the risk of major depression again, I believe we inevitably face the danger of major war again. The “black” or secret portions of the budget are almost as large as the entire expenditure of defense funds by America’s allies, hardly slouches when it comes to feeding their own militarist beasts. In testimony before the Senate Committee on Intelligence, Obama’s new Director of National Intelligence, Dennis Blair, warned that the deepening world capitalist crisis posed the paramount threat to U.S. national security and warned that its continuation could trigger a return to the “violent extremism” of the 1920s and 1930s. Clearly underlying his remarks are fears within the massive U.S. intelligence apparatus as well as among more conscious layers of the American ruling elite that a protracted economic crisis accompanied by rising unemployment and reduced social spending will trigger a global eruption of the class struggle and the threat of social revolution. The world is moving towards establishing, within decades, a global government structure. Moving the utopian rhetoric of such an undertaking aside, we must analyze how such a structure is being built. Given the global economic crisis, the governments of the world are restructuring their economies, and the global economy as a whole, into a corporatist structure. Thus, this new international economic system being constructed is one representative of economic fascism. The governments now work directly for the banks, democracy is in decline everywhere, and the militarization of domestic society into creating “Homeland Security states” is underway and accelerating. Any notion of a “free market” must be dispelled in its true meaning, for as long as the central banking system has been dominant, central bankers have managed and controlled capitalism for the benefit of the few and at the expense of the many. Comprehending the nature of central banking is necessary in order to understand the nature of the current economic crisis. The central banking system has been the most powerful network of institutions in the world; it reigns supreme over the capitalist world order, almost since its inception. Central banks are the perfect merger of private interests and public power. They have played key roles in every major development and drastic change in the capitalist world economy, and continue to do so. Central bank policies caused the Great Depression and played an enormous role in creating the Global Economic Crisis of 2008 onwards. As the “solutions” to the economic crisis are being implemented, it would appear that those that created the crisis are being rewarded. The central banking system is becoming more globalized, more centralized, and more powerful. Wary observers might say that this is how you pull off a private global dictatorship: (1) create a global crisis; (2) appoint an “advisory body” to retain and maintain “stability”; then (3) “formalize” the advisory body as global regulator. By the time the people wake up to what has happened, it’s too late. If we the people of the world are to avoid abdicating the sovereignty of our respective nations to a private foreign banking elite, we need to insist on compliance with the constitutional and legal mandates on which our nations were founded. The very concept of a global currency and global central bank is authoritarian in its very nature, as it removes any vestiges of oversight and accountability away from the people of the world, toward a small, increasingly interconnected group of international elites. Indeed, the policy “solutions” tend to benefit those who caused the financial crisis over those who are poised to suffer the most as a result of the crisis: the disappearing middle classes, the world’s dispossessed, poor, indebted people. Real economic democracy, defined as the unfettered opportunity for every person to achieve his productive potential and be fairly rewarded for doing so, does not exist on the earth today. The economic life of the world today is based on predatory capitalism, where the people with the most money are the ones in charge. Instrumental in control of economics by the rich has been the debt-based monetary system, where credit is treated as the monopoly of private financial interests who in turn control governments, intelligence services and military establishments. Politicians are bought and sold, elected or removed, or even assassinated for this purpose. The global monetary system is tightly controlled and coordinated at the top by the leaders of the central banks who work for the world’s richest people. The worldwide monetary reform movement has come into existence to secure the benefits of control of the monetary supply by the community rather than monopolistic cliques exemplified by the Western banking system. While this is only one means of attaining economic democracy, it may be the most important one, because money as an instrument of law controls all commodities. When the smartest guys in the room designed their credit default swaps, they forgot to ask one thing – what if the parties on the other side of the bet don’t have the money to pay up? If there are no rules, the players can cheat; and cheat they have, with a gambler’s addiction. The Ponzi scheme that has been going bad is not just another misguided investment strategy. It is at the very heart of the banking business, the thing that has propped it up over the course of three centuries. A Ponzi scheme is a form of pyramid scheme in which new investors must continually be sucked in at the bottom to support the investors at the top. Is it possible to make hundreds of billions of dollars in profits on securities that are backed by nothing more than cyber-entries into a loan book? It is not only possible; it has been done. And now those who cashed in on the swindle have lined up outside the Federal Reserve building to trade their garbage paper for billions of dollars of taxpayer-funded loans. Where is the justice? Meanwhile, the credit bust has left the financial system in a shambles and driven the economy into the ground like a tent stake. The unemployment lines are growing longer and consumers are cutting back on everything from nights-on-the-town to trips to the grocery store. And it’s all due to a Ponzi-finance scam that was concocted on Wall Street and spread through the global system like an aggressive strain of Bird Flu. This is not a normal recession; the financial system was blown up by greedy bankers who used “financial innovation” game the system and inflate the biggest speculative bubble of all time. And they did it all legally, using a little-known process called securitization. In view of the large number of pre-publication orders already received, there could be some delay in the shipping of the book. Thanking you for your understanding. Please Note: Overseas orders which do not include the Overseas Surcharge will be sent by surface mail. Allow up to 8 weeks for delivery to Europe. $10.00 for orders of less than fifty dollars. Enter the surcharge twice if your order is over fifty dollars. SPECIAL OFFER: PURCHASE THREE COPIES AT $40.00, TEN COPIES AT $110. Mail order Form (Print, Fill out the Form and Send to Global Research (optional) (Single purchase of book is $15.00 plus 9.50 s&h =$24.50).